If there was ever a word that sounded like what it means, that word is gobbledygook. As in, “I have no idea what he said; it was all gobbledygook to me.” From Merriam-Webster we know it means, “speech or writing that is complicated and difficult to understand”. Also, “wordy and generally unintelligible jargon”. I’ll bet you knew that. And I’m guessing many of you, dear readers, also know that gobbledygook is the native language of goblins in the Harry Potter series. You didn’t know? More here. Its origins are brilliant. Coined in 1944 by Maury Maverick, a Texas lawyer to describe obscure language. It’s said his inspiration was the turkey, “always gobbledy gobbling and strutting with ludicrous pomposity”. On the Plain English site, I found a gobbledygook generator. Really. Check it out. I’d like to thank @auntie_jenn for suggesting this word. It really is a good one. So fun to say. Go on. Try it; gobbledygook. Franklin Covey’s Writing Advantage class features that word. It is in their style guide. Good stuff. 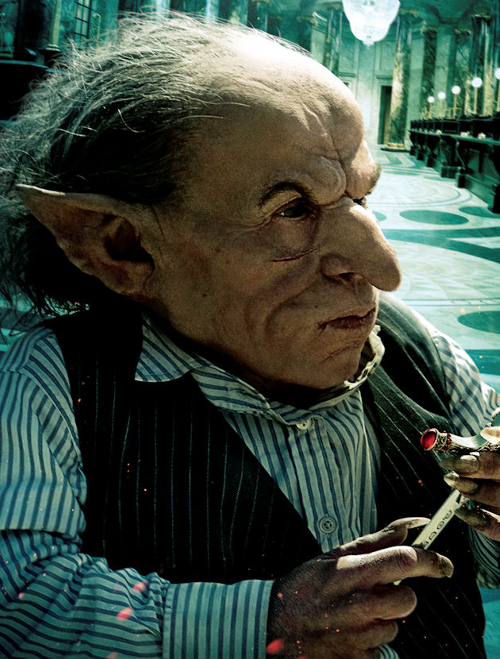 Oh and those goblins in HP are creepy.